Today, was a bit of everything, this morning we both had Dental appointments, lovely man, but obviously likes to see his patients! I have had a problem with one tooth, I was, and still am convinced it is a cavity, but the Dentist says not, he says I have an infection, and besides having to floss at least three times a day, I have got to mouth wash with Bicarb of soda, that doesn't sound very nice. I have to return in two weeks for the infection to be dug out, then a further appointment with the Hygienist, followed by three monthly appointments, because he wants, I quote 'to look after' my teeth personally! This is unusual, because you don't usually see the same Dentist twice, and it is the luck of the draw who you see. First thing this morning, and again this afternoon, I have been working on another woodwork project making a hold-down toggle clamp. 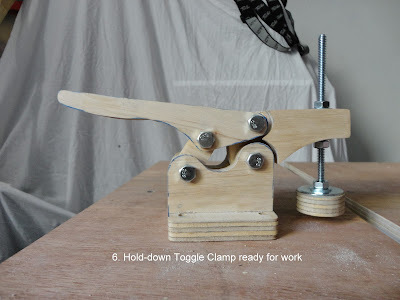 I won't go into the details here, because I am also running my projects on Google+ and it can be seen here: Hold-down Toggle Clamp. Tomorrow the project is making C-Clamps using plumbing parts, so unfortunately no wood! Late this afternoon, I had to put my Plumbers hat on, because Maria Elena ( my Suegra) had snapped the shower head, unfortunately she had snapped it off, leaving the thread in the pipe fittings, it wasn't easy, but I managed to get the bit out, and then, fitted a metal extension, before the new shower head, now hopefully if there are any problems in the future, it will be easy to deal with.